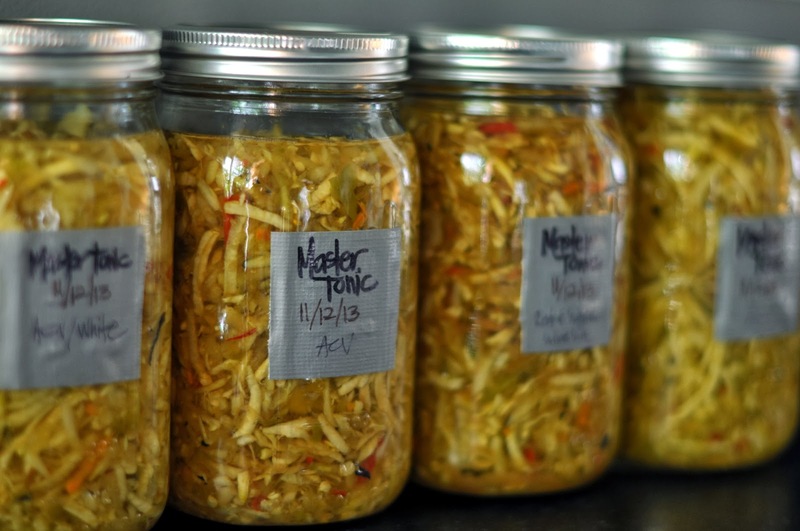 What I call Master Tonic is also sometimes known as Four Thieves Vinegar – there are a ton of different recipes and you can make this to take internally or use as a salve. But basically, Master Tonic is a concoction of roots and herbs steeped in vinegar. The resulting tincture is a powerful healer and immune system booster, especially during cold winter months. I dilute mine with water and administer it orally. Master Tonic has anti-fungal, anti-bacterial and anti-viral properties and may help stave off colds, flu, fever. 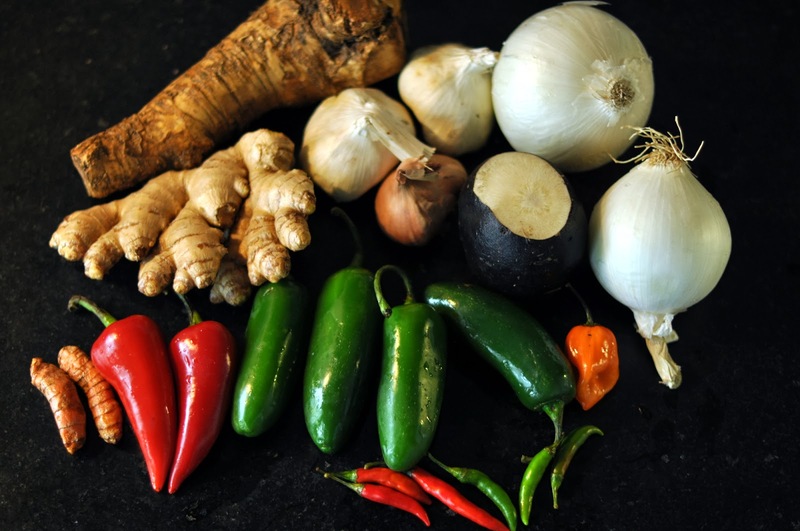 Almost any winter illness you can think of, Master Tonic can help. When taken daily as a preventative, it spreads sensations of warmth and well-being through your body. It's kind of like that good feeling that comes from drinking coconut water on a hot summer day. The name “Four Thieves” comes from medieval times, when a band of thieves allegedly avoided contracting the highly contagious plague as they robbed houses of the ill. The reason is said to be because they used this tonic. Sometimes the vinegar/herb mixture is applied topically, but those recipes call for ingredients like wormwood and camphor that are not necessarily suitable for internal use and can be difficult to find. There are essential oil blends you can buy commercially called just “Thieves” - they are usually based on cinnamon and clove extracts. It smells great but I find the edible tonic to be more effective at fighting illness. Plague doctors would rub Thieves oil on pressure points and inside their plague masks in order to ward off germs. 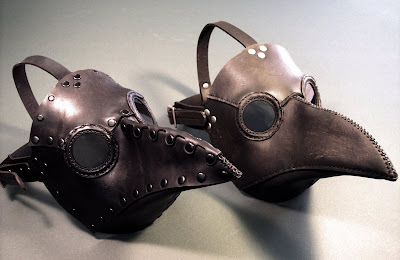 As a side note, how awesomely creepy are plague masks? The one below on the left is a beautiful replica of an original (pictured right), which you can buy from this talented artist. My edible Master Tonic recipe uses easy-to-source, common vegetable roots that you probably already have in your kitchen (well, you might not have horseradish root laying around, but it's available in most supermarkets). Always use fresh, organic ingredients if possible. I will vary my recipe depending on what's available and what my intuition is guiding me to concoct. Here is a Master Tonic I made back in November. You will want to wear gloves when handling horseradish root and hot peppers. Horseradish root is very strong smelling when grated (it will sting your nostrils and clear your sinuses)! Definitely wear gloves when working with hot peppers because otherwise the juices will soak into your skin and if you touch your eyes or any other mucous membrane even after washing your hands, it's gonna burn like crazy. Peel and chop all the ingredients. A food processor is the easiest way to do the chopping, especially if you're making a big batch. Stir everything together well in a mixing bowl, then fill some canning jars about halfway full of the mixture. Then cover with vinegar and label the jars. That's pretty much it! I usually use apple cider vinegar because it's so much better for you than the other kinds. But this time I ran out of ACV, so I used mixtures of red wine and basic white vinegar for some of my jars. The taste will be slightly different but any vinegar will work. Store in a cool dark place for two weeks or up to a month. Strain out the liquid, re-bottle it, and use as needed. I usually fill a shot glass about 1/3 of the way full with tonic, then dilute with water. It also makes a good gargle for sore throats. 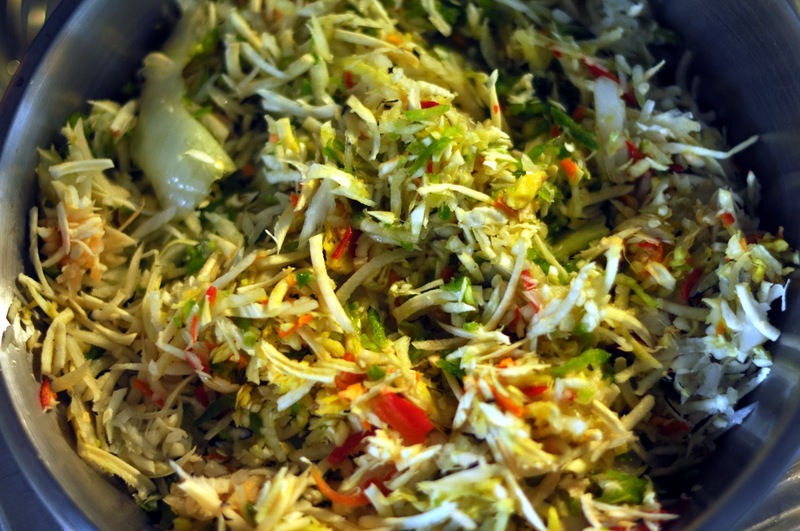 I like to use the leftover shredded vegetable matter in cooking. It makes a delicious salad dressing – just add lemon juice, olive oil, salt and pepper, and a bit of honey to balance out the tanginess. 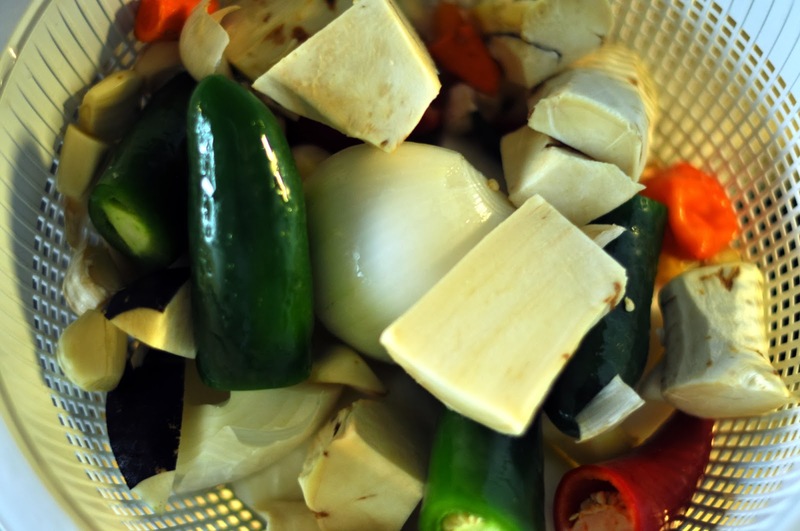 It also makes an excellent meat marinade, especially for grilled chicken – again just mix the grated vegetables with some cooking oil and viola. This fiery tonic has so many uses and makes you feel so good - everyone should have a bottle on hand! Do you leave seeds from the hot peppers in the mix or take them out first?